Fortune Shoes Limited IPO Information view details here. Fortune Shoes Limited IPO Lottery Result has been published Today on Wednesday, 21 September 2016. Place: Engineering Institute, Ramna, Dhaka. See the Result below. Total Applied 42.19 Times, General Applied 72, Affected Applied 33, NRB Applied 14, MF Applied 56 and Intuition Applied 20.5 Times. Subscription Open: August 16, 2016, Close: August 28, 2016. 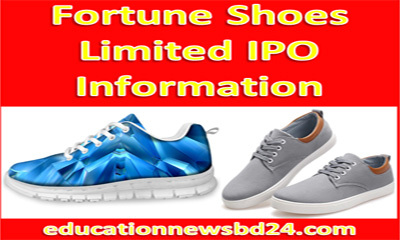 Bangladesh Securities and Exchange Commission (BSEC) has approved the initial public offering (IPO) of Fortune Shoes Limited on 29 June 2016 on his 579th meeting. The company has expressed its intention to collect Taka 22 crore from the capital market offering 2 Crore 20 Lac ordinary shares to issue share prices at Taka 10 as face value. The company’s earning per shares (EPS) Taka 1.03 and net asset value (NAV) Taka 13.75 according to the financial statement of 9th Month ending on 29 February 2016. Imperial Capital Limited and Prime Bank Investment Limited have acted on behalf of for the company’s issue managers. The company will spend the capital in setting up Building Construction, buying machinery & equipment and IPO related other relevant expenses. according to the financial statement of 9th Month ending on 29 February 2016. Fortune Shoes Limited (FSL) was incorporated in Bangladesh as a Private Limited Company with the issuance of Certificate of incorporation bearing Registration no. CH-7590/10 of 2010 dated on March 14, 2010, by the Registrar of Joint Stock Companies & Firms, Chittagong, Bangladesh. The Company Converted into public Limited Company in 2015. The Company started its commercial operation on 07 September 2011. The principal activities of the company are to carry on the business of manufacturing and exporting all kinds of leather shoes, footwear etc. The factory premise of FSL is located at Plot # 66, 67, 68, BSCIC Industrial Estate, Kawnia, Barisal, Bangladesh. Fortune Shoes Limited exports footwear products in many countries in the world. It exports leather shoes, footwear to Germany, Netherlands, Spain, France, Taiwan, Sweden, Switzerland, Canada, Germany and the UK and China.